There was no way I wasn’t going to get June’s Muller Music Meta. After my stinging, unnecessary defeat in May, I would’ve moved mountains and crossed oceans in order to succeed. Fortunately such feats of strength and endurance proved unnecessary since the June metapuzzle was both elegant and not-too-tough. Instructions asked for a greatest-hits album, but theme material was elusive. ITALIAN-AMERICAN [Like Ani DiFranco or Gwen Stefani] was the only grid-spanner (which later turned out to be quasi-theme). Right after solving the puzzle I was thinking it might be Madonna’s “Immaculate Collection,” due to the puzzle’s title (“Religious Inscription”), plus ITALIAN-AMERICAN, plus MACC leading up from E-MALL. Only now as I’m typing this do I realize that the word “immaculate” does not, in fact, contain the letter sequence MACC, but at the time I thought it did and seemed to point towards Madonna. I thought this was an elegant idea for a meta and masterfully executed. I’ve written a couple hundred of these puppies and it never struck me to wrap the meta around chunks of black squares like this, so high marks for originality. The fill is so wide-open and good that there was no “poor-fill alert” that a meta was lurking nearby, which made seeing the revealers so tricky that even when I knew what I was looking for I didn’t see it right away. Then, like a good Magic Eye puzzle and good meta, it suddenly emerged and seemed so obvious in retrospect. 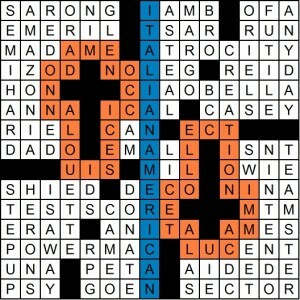 I want to re-emphasize how good the fill is in this, especially considering how Madonna’s name and greatest-hits album affect so many parts of the grid: AMAZONIA, CIAO BELLA (another quasi-themer), POWER MAC, TEST SCORE, ANY DAY, SWIM MEET, NINTENDO, ALOUETTE and AC/DC are welcome in any freestyle puzzle. A few suboptimal entries alongside, true, but they don’t rise to the level of my mentioning them. This is an ambitious idea and grid and it totally succeeds. 4.75 stars. My favorite MMMM of the year so far. Bravo to Pete, and I’ll see you back here for the July meta. BTW, has anyone taken a stab at the mega-meta so far? I sense things will start to get tougher very soon around these parts. This entry was posted in Contests and tagged Pete Muller. Bookmark the permalink. thanks Matt – glad you liked it! I sent in Immaculate Collection on Sunday based off nothing more than the crosses in the grid and ITALIAN-AMERICAN. I never saw the meta fill around the crosses. Better lucky than good I suppose. I stopped there and sent in the answer. Big surprise that I was wrong. Oh Well. Excellent puzzle all around. I struck out on last month’s MMMM, so was glad to get one right. Excellent, mind-blowing “Puzzle of the Year” candidate! When I get stuck, I look for things around the black parts of the MGWCC all the damn time. I’ll probably stop a couple months before you use that trick yourself. Hmmm, I guess no one else got distracted by the hidden Hey Judes “inscribed” in the crosses. Spent several days on that rabbit trail before I finally noticed the circumscriptions!